After a teenage girl's remains were discovered in Oregon in 1971, her identity remained a mystery for decades. Investigators worked to identify the girl, who became known as Jane "Annie" Doe, but were unsuccessful. But thanks to DNA and genetic genealogy, officials have finally discovered who she was -- Anne Marie Lehman. Now they're determined to learn how she died. The mystery dates back to August 1971, when Lehman's scattered skeletal remains were found in the woods in Josephine County, Oregon, the Josephine County Sheriff's Office said Thursday. Investigators exhausted their leads and the case was deemed inactive. Then in 2004, a deputy made a clay facial reconstruction of the victim, nicknaming her Jane "Annie" Doe, the sheriff's office said. The image was released and leads came in, but the mystery remained unsolved. In 2016, forensic isotope analysis -- which analyzes hair, teeth and bones to help determine likely geographic origin -- helped narrow down where Jane Doe was likely from and a new forensic drawing was released, the sheriff's office said. Although she resembled a missing person in Massachusetts, investigators could not make a DNA match. The break finally came in late 2018 when the DNA Doe Project became involved. The non-profit compares DNA from unidentified John and Jane Does to people who voluntarily submit their DNA to public genetic genealogy databases, the sheriff's office said. "After weeks of careful analysis and painstaking ancestral research, Jane Annie Doe's family was traced to relatives in England, New Zealand and Canada," the sheriff's office said in a statement. Lehman's DNA was very degraded, making it difficult to find matches to relatives, the sheriff's office said. Then in February, DNA Doe Project volunteers told detectives a potential match was found with a sister in Washington state. Authorities reached out to the sister and got a DNA sample from her, confirming Lehman's identity, the sheriff's office said. Jane Annie Doe was really Anne Marie Lehman -- who happened to be nicknamed Annie by her family, the sheriff's office said. Anne Lehman, of Aberdeen, Washington, was 16 years old when she disappeared. Investigators believe went missing from Aberdeen in the winter or spring of 1971, the sheriff's office said. Authorities are still working to determine how Lehman died and ask anyone with information to call the Josephine County Sheriff's Office. "Some say Annie Lehman was a runaway and others feel she was abducted and traded to a criminal human trafficking organization," the sheriff's office said. "These claims, how she ended up in Josephine County and the cause and manner of her death remain under investigation." Meanwhile, authorities are praising the work of investigators who they say tirelessly tried to solve the mystery of Jane Annie Doe. "Forensic genetic genealogy is fast becoming the most powerful new tool for solving cold cases that have resisted all other approaches," the sheriff's office said. 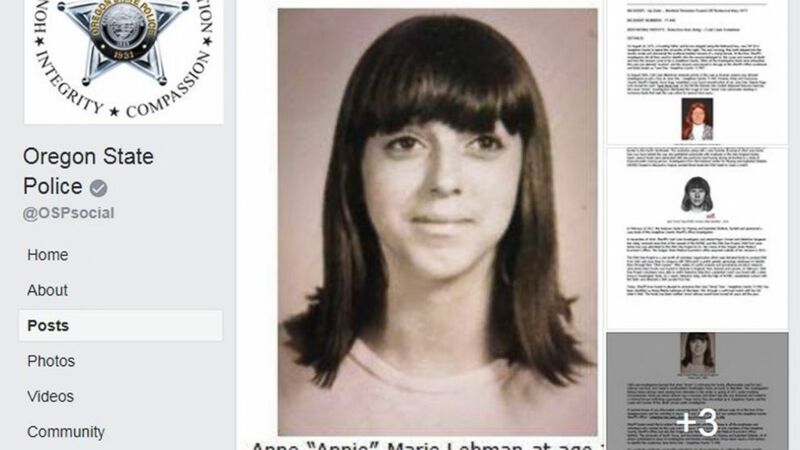 "Without the DNA Doe Project orchestrating the effort to bring Annie Marie Lehman home, it may well have taken another 47 years before Annie would be identified and reunited with her family." The Oregon State Police in a statement said it's "extremely proud of the work performed by our Forensic Anthropologist, Dr. Nici Vance. Dr. Vance's unwavering dedication and tenacity to helping identify these remains and bring closure to families just like the Lehman's is inspiring."